We thought finding a spider in your ear was bad. But a 32-year-old woman in Russia had a live worm removed from her face, and we just can’t. It sounds like a horror story, but this very real case of the heebie-jeebies appeared in the New England Journal of Medicine this week. The patient documented the moving creepy-crawly in a series of selfies (naturally) seen below. She first noticed a lump below her left eye, which moved above her eye a few days later. Ten days after that, the lump settled into her upper lip. Other than having a bump moving around her face, she experienced only occasional bouts of an itching and burning sensation. D. repens typically infects dogs and other carnivores and causes swelling and itching. When it finds its way into humans, it’s usually by accident, according to the Centers for Disease Control and Prevention (CDC). Those cases typically play out pretty much just how it did for the woman in the NEJM: A single parasite under the skin that (thankfully) can’t reproduce but can move around. 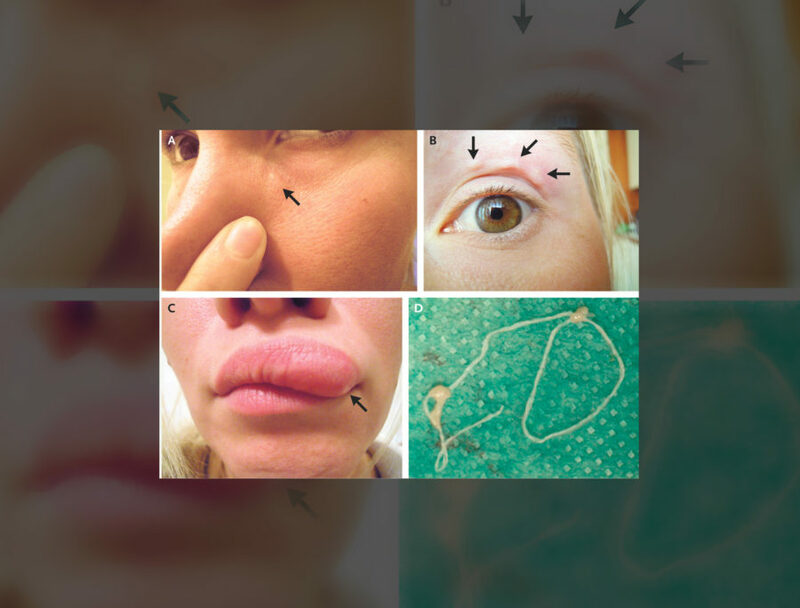 When a person finds themself playing host to D. repens, they have mosquitos to blame — and the woman in the NEJM report “recalled being frequently bitten” on a recent trip, the authors wrote. (As if you needed another reason to avoid mosquito bites.) The worm is currently only found in Europe, Asia, and Africa — and there have been more than 3,500 human cases in Europe alone since 1977.